Fairies and ponies, ballerinas and bows; all things nice, may not be what all little girls are made of but this omnibus picture book collection, Sugar and Spice, fresh out of the uber productive creative forge of EK Books is sure to delight even the fussiest of feminie tastes. Designed with little girls in mind, this three-volume picture book gift set features stories by three different authors, each illustrated by Gwynneth Jones. Enjoy them individually or as a boxed collectors’ set. 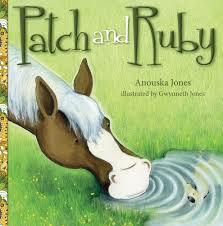 The first we devoured was Patch and Ruby by Anouska Jones. My Miss 10 reviewed this one but I’m inclined to agree with her response. Sweet and impossibly alluring, Patch and Ruby is a story full of ponies and chooks and cuter than cute meeces. Jones’s narrative is warm and restrained enough to sustain short attention spans whilst the illustrations excite the tactile senses and illicit quite a bit of cheeky humour. Keep an eye out for the chook in rollers. So clever. Patch and Ruby is a gentle tale about finding your perfect fit and making friends along the way. The notion of seeing things from another person’s point of view is secreted away in Patch’s longing to find that missing something in his life yet pre-schoolers will be satisfied enough, soaking up the gorgeous equine inspired atmosphere of this tale. Dance with Me is the second slice of sweetness in this set. Penny Harrison has penned another story ostensibly aimed at sweet young ladies under eight but adorable enough to be enjoyed by pre-schoolers, everywhere. 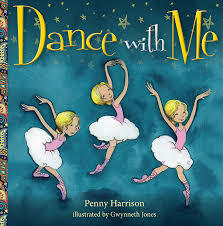 Dance with Me is a timely tale of affections and life changes. I can’t help but hear Frank Mill’s, Music Box Dancer in my head when I read about the beautiful pink clad ballerina who ‘lived in a small, wooden box.’ She and her little girl enjoy many joyful dances together until one day the little girl grows up and the ballerina is free to enjoy her own dances far from her box. However, her adventures are cut short when she is relegated to the shelf for many years until one day, someone new calls her to ‘come, dance…’ once more. Gwynneth Jones’s spectacular use of altering perspectives, subtle colours, and Decalage (the metaphoric visual interpretation of the text to show a different meaning) is spot on and once again cleverly pins readers to their seats. 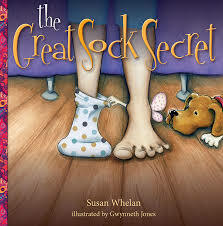 Susan Whelan is the author of the third spicy instalment, The Great Sock Secret. I love how the fairies rule supreme in this toe-levelled view about one of the first world’s most cryptic mysteries: where do all the odd socks go? Jones’s eye-popping illustrations are phenomenal, revealing to the reader what Sarah already knows about the missing socks in her home. Whelan takes the reader on a whimsical treasure hunt of subterfuge as Sarah tries to preserve the fairies’ secret from her mother. Fast paced and fun, The Great Sock Secret will make you stop and think next time you are faced with mismatched laundry and reticent children. 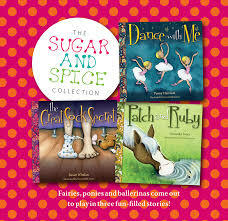 All three Sugar and Spice picture books will bring a smile to your face and comfortable warmth to your heart. They are easy to read, diverse in flavour and delivery and beautifully presented; the rich paisley patterned spines are just glorious. These beautiful tales also stirred up many fond childhood memories; of my own music box dancer, backyard ponies, and the inevitable transitions we all make from childhood to adulthood. Thankfully, stories like these ensure an infinite sense of innocent pleasure and pure magic for generations to come. Highly recommended for ages 4 and above. 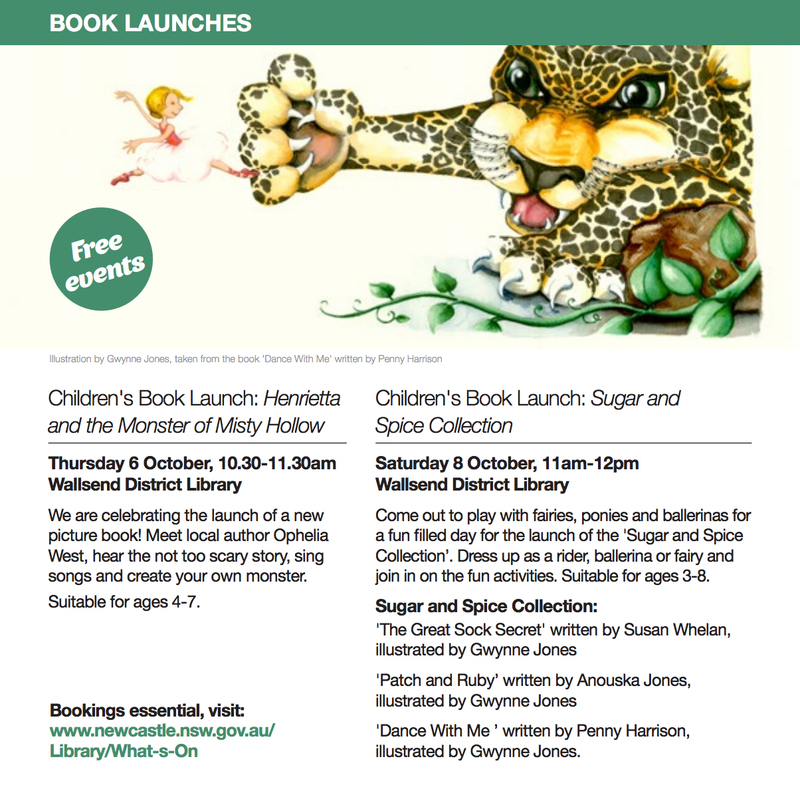 For those lucky enough to reside in NSW, head to the Wallsend District Library this Saturday, 8 October for the official Sugar and Spice Collection Launch.